Subjecting yourself to a sudden temperature change is probably one of the worst things to experience, and if you’ve gotten out of a warm shower, then you have probably felt it to a certain degree. What this does is make you stay in the shower for as long as you could in fear of the cold air that will hit you as soon as you get out of the shower. This, however, only makes things worse. To circumvent such a terrible feeling, one could preheat the towels so that they have something warm to cover themselves with when they get out. But what is the best way of doing it? 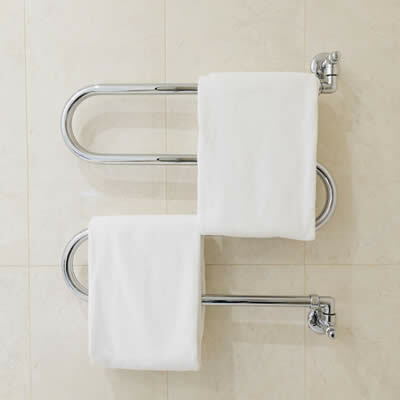 One of the possible ways of tackling the issue could be by installing a radiator to heat the towels. However, this is far from being the optimal solution. This is mainly due to the fact that, while one half of the towel will be warming up just fine, the other half will have to face the back side of the radiator which is usually not so clean, to put it gently. This is where towel warmers come in to save the day. You can simply put your towels on a nice, clean surface right next to where you shower and let them warm up. By the time you finish, they’ll be all cozy and comfortable, and fearing the cold will be a thing of the past. Oh, and you can also use to warm up clothes in the same manner, which is rather handy. Now, before you get too excited and go out looking for a towel warmer to buy, keep on reading this article as we’ll make sure that you buy the best sheet warmer for your house. As you might expect, there are plenty of options available on the market, each one claiming to be better than the others. But the only way to truly find out is to test them, which would be very impractical for you. Don’t worry though! We’ve done all the work for you, and we came up with a list of the five best towel warmers on the market, so you don’t have to waste your time sifting through a thousand products to find what works best with your needs. So, Which is the Best Towel Warmer? And now, without further ado, let us kick off the list with the first product. The HEATGENE Towel Warmer is a sheet heater that is mounted on the wall and plugged to a power socket. It can heat up to about 149 degrees Fahrenheit, or about 65 degrees Celsius. It’s perfect for modern bathrooms thanks to its minimalistic, yet elegant design. It’s made from stainless steel along with a shiny, reflective finish which gives it a great look. When it comes to installation, the HEATGENE Towel Warmer is a DIY unit. The can assemble it quickly and easily by yourself thanks to it being lightweight. Not having to call in a professional to set up this product cannot be understated as it saves you time, money and possible headaches. And while we’re on the subject of saving money, it heats up rather quickly which means that you don’t have to keep it turned on for long, which indirectly saves you money that you would have otherwise had to spend on electricity bills. As we mentioned before, this towel heater is wall mounted which means that you can install it anywhere without having to worry about space. Again, this just adds another reason to consider it. To put it simply, the HEATGENE Towel Warmer 8 Bar Radiant Plug-in Curved Bath Towel Heater can be described by many words. It’s practical, elegant, compact, convenient, and most of all, cost-effective. This has earned it a place on this list. There is one thing you should keep in mind though. Try not to install it way too high on the wall, as you can render its power switch unreachable. 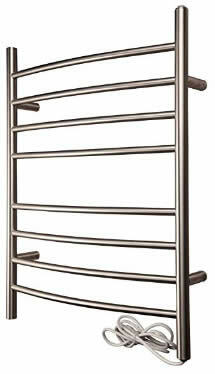 The Amba RWH-CB Towel Warmer is another wall mounted towel warmer. Its design screams luxurious thanks to its polished stainless steel finish. Simply put, this is the type of thing you’d only see in fancy spas. Aside from looking stylish, the curved bars on this towel warmer make it so the sheets will drape over the heated crossbars smoothly while also preventing them from falling on the floor while you shower. Just like the HEATGENE Towel Heater, the Amba RWH-CB Towel Warmer can heat up to 149 degrees Fahrenheit or 65 degrees Celsius, so be wary not to touch it as it can burn you accidentally. As we mentioned before, this towel warmer was designed with practicality in mind so your towels will be heated rather quickly thanks to its impressive heating capabilities as well as its sleek design which makes it so both sides of the sheets will be equally warmed up. A feature that is pretty neat is the fact that you have the option of buying a plugin that implements a timer mechanism so you can choose for how much you want to heat your towels. Automating this process is not only convenient, but it can potentially save power, which implicitly cuts down the long term cost of this product. 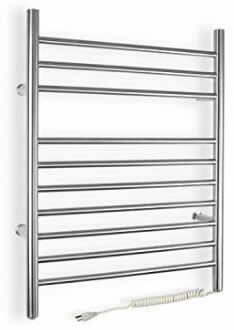 If you’re looking for a practical and elegant towel warmer that’s wall mounted, then the Amba RWH-CB Radiant Hardwired Curved Towel Warmer is an excellent choice. Our only caveat with it is the fact that you might need to hire an electrician to set it up as it’s hardwired. The HomCom 6-Bar Freestanding Lightweight Aluminum Electric Towel Warmer Drying Rack is different from the aforementioned elements on the list as it’s the first freestanding towel warmer. Its design is simple and very functional. It offers enough space and horizontal bars to hang up to two large towels at a time. This high capacity is especially handy for women who prefer to use two sheets for their hair and body. While wall mounted towel warmers save up on space, freestanding towel warmers are more versatile as they are more mobile. If you have a large bathroom, you can change their place to your liking as well as move them from room to room if you so desire. This means that you can also use it to dry your clothes more efficiently. On top of that, it’s effortless to set up as you’ll only need four screws to assemble it. It’s also built to resist moisture. The on and off switch is protected by a special casing so it won’t get damaged by humidity or water splashes. This towel warmer isn’t as potent as some of the other options on the market when it comes to heating capabilities, so you’ll need to leave it on in advance before you go in the shower. However, it won’t cost you as much as some of the other towel heaters available on the market, since it’s on the cheaper side of things. You’d actually be surprised at how much bang for your buck you’ll be getting from this. When it comes to space, the WarmlyYours 10-Bar Infinity Towel Warmer can hardly be rivaled as it offers 10 bars for you to hang your towels on. This is extremely hand as warming up multiple sheets at a time will help you stay warmer for much longer. Design-wise, it doesn’t differ from the other wall mounted options listed here, and by that, we mean that it looks elegant thanks to its brushed metal finish. Did we mention that it’s also wall mounted? This means that you’ll be able to hang a lot of towels at a time and save space while doing so, now that’s what we call space management with style! It’s also designed in such a way to make it incredibly user-friendly. You won’t need to call in a professional to set this thing up, all that is required of you is that you mount it on your wall and plug it in, and voilà! It’s ready to be used. As for heating capabilities, you’ll be pleasantly surprised to hear that the WarmlyYours 10-Bar Infinity Towel Warmer is as efficient as it is spacious, being capable to heating up to 140 degrees Fahrenheit or 60 degrees Celsius. While it isn’t the hottest on the market, it should be enough to keep you warm. Not only that, but it also comes with a 2-year manufacturer warranty, so you’ll know for sure that this product is built to last. 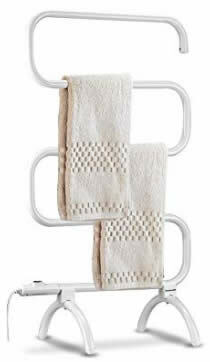 Honestly, there isn’t much to not like about the WarmlyYours 10-Bar Infinity Towel Warmer. Granted, it doesn’t offer the best heating, but it’s hard to argue with the feature limitations considering the low price tag. Last but not least, we have the Winsome Dayton Storage Hall Bench with Shelves which is a freestanding towel warmer. It easily stands out from the products listed here with its quirky design. Don’t be fooled into thinking that it’s just a gimmick though. It’s as quirky as it is versatile! In fact, calling it a towel warmer might not do it justice as it can also be used to hang bathrobes or even drying clothes in general. The fact that it’s freestanding only makes it even more versatile by making it portable. When it comes to how much you can hang on it, you’d be surprised at how much it can carry. With that said, its heating capabilities are on the lower side of the spectrum, being only able to heat up to 114 degrees Fahrenheit, or 45 degrees Celsius. However, it can reach that temperature in less than 30 minutes which isn’t bad. Even though the Winsome Dayton Storage isn’t the most potent heat warmer on the market, its impressive versatility is what earned it a place on this list. When you’re buying this product, you’re not only getting a towel warmer, you’ll also be purchasing a cloth dryer too, which is nifty, and can be extremely helpful for some people. Towel warmers are remarkably easy to install with just a little DIY knowledge. The video below takes you from start to finish of the whole process to give you an idea if you can do this yourself, or if you need to get someone in to help. The main take off from this list is that you’ll need to make a decision based on your needs. Are you looking for something that won’t take up much space? Take a gander at the wall mounted options on this list. Are you running a tight budget? Try looking for something that won’t cost much. 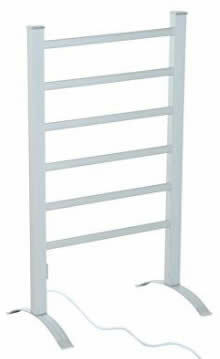 The HomCom 6-Bar Freestanding Lightweight Aluminum Electric Towel Warmer Drying Rack would be a perfect choice for you. Do you want to avoid calling in a professional to install the towel warmer, then you’re better off picking a plug-in product rather than a hard-wired one. These are just a few examples on which you base your decision. We have provided you with the best options on the market, and all you have to do is assess your situation and make the appropriate decision. 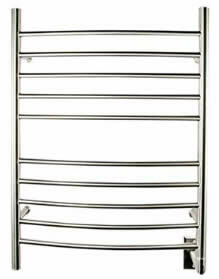 Towel warmers can make or break your experience in the bath, which is why you shouldn’t ignore them. When getting such an appliance, take your time to determine your needs and compare the different products, and your body will be ever in your favor. We thank you for your time, and we hope you find this article to be useful. If you did, be sure to share it with anyone who you think will benefit from it!